32 pages; 9.25 x 9.25 in. ...because a snake would lose it, a billy goat would eat it for lunch, and it would always be wet on a walrus! 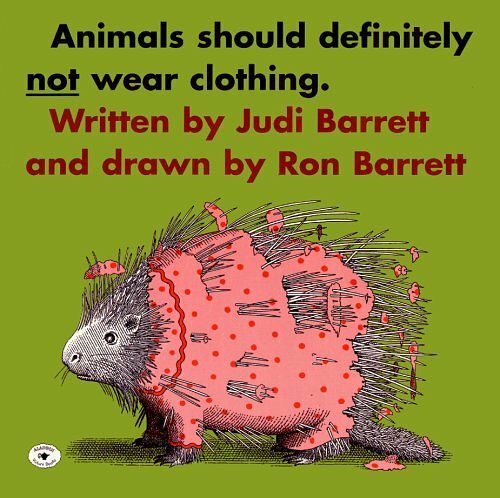 The classical illustrations of animals wearing clothing in this well-loved book shows the very youngest why animals' clothing is perfect... just as it is. Brightly colored, humorous illustrations that accompany the brief, large-print text reveal just why not. Eating out of a trough while sporting a crisp white shirt and neatly-knotted tie makes things "very messy" for a pig; a sheep wearing a heavy muffler, sweater, and hat over his heavy white fur "might find it terribly hot." The text and illustrations allow readers to easily understand and interpret what's happening in the book and will prompt discussions about why animals are content to live in their own ready-made clothing &emdash; fur, prickles, or blubber, to name just a few. This book's unique and original approach will help emerging readers understand why animals and humans are different in a lighthearted manner, and it is sure to be read again and again. Children definitely will not keep strait faces. Tape a picture of an animal to the back of each child. Children walk around quietly asking questions to each other that can only be answered Yes or No to find out what animal they are wearing. 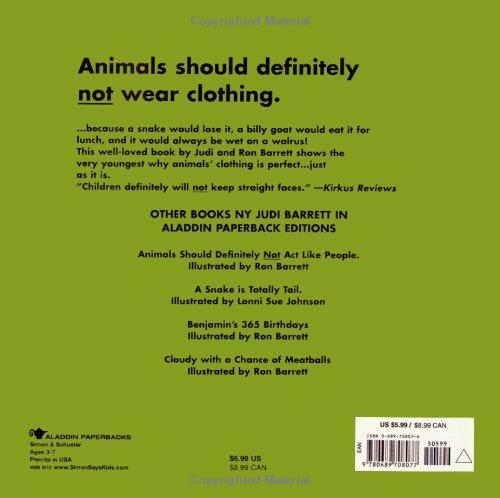 Judi Barrett is the author of many well-loved books for children, including Cloudy With a Chance of Meatballs, Pickles to Pittsburgh, Animals Should Definitely Not Wear Clothing, and Things That Are Most in the World. She teaches art to kindergarten students at a school in her Brooklyn, New York, neighborhood. And she usually doesn't mind going to the dentist! Ron Barrett has collaborated with his wife, Judy, on many children's books, including Cloudy With a Chance of Meatballs, Pickles to Pittsburgh, Animals Should Definitely Not Wear Clothing, and Things That Are Most in the World. They live in New York City.